There's a national treasure hiding deep in the coffers of the University of Canberra--a den of literary plenty, stuffed with thousands upon thousands of children's books--modern but also rare. This collection speaks of a stunning children's literature history, showcasing over 25,000 titles, valued at almost one million dollars. But this treasure--the Lu Rees Archives--really is invaluable. Lu Rees, MBE, AM, was the Secretary of the Canberra Fellowship of Australian Writers and was a Life Member of the Fellowship. During her time as Secretary, she initiated the publication of Australian Writers, Australian Signpost and Span, and later assisted with Australian Voices. In 1957 she became the first President of the ACT Branch of the Children's Book Council, and later a Life Member of the Council. 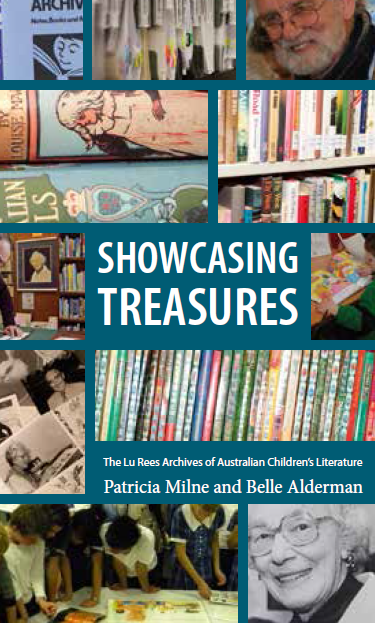 The Archives was named in honour of Lu Rees and her work for Australian children's literature. In 2014, the Archives are 40 years old, and to celebrate, Belle Alderman AM, Director of the Archives, and Patricia Milne, a researcher for the Lu Rees database project, have come together to produce a beautiful book--Showcasing Treasures--which perfectly illustrates the Archives, its collections and the formidable work it does for children's literature. Edited and project-managed by Margaret Hamilton AM, Showcasing Treasures features the history of the Archives, the volunteers and people behind its success, its formidable resources, research capabilities, exhibitions, awards and achievements, including the Festival of Australian Children's Literature. A heart-thumping chapter on building the book collection features the Archives' enviable acquisitions of priceless works, Lifeline Book Fair finds and private donations, including rare Colin Thiele books, donated by the author's daughter. Peppered with photographs, book covers (naturally!) and illustrations, this is a work of deep passion, and a tome to be dipped into over and over again. A timeless book to treasure. Showcasing Treasures will be launched this weekend at the CBCA Conference in Canberra, where it will be available for purchase. You can also purchase a copy online. The Archives are currently running a GoFundMe campaign that will allow Belle Alderman to continue her search for missing books for the Archives.